Yikes! It’s our last day – Day 5 of our Blog Hop and Giveaway with Lawn Fawn! We have more amazing projects from both design teams. Read through to the end of the post to enter to win. It’s never too early to start creating the perfect tag for all your gifts. 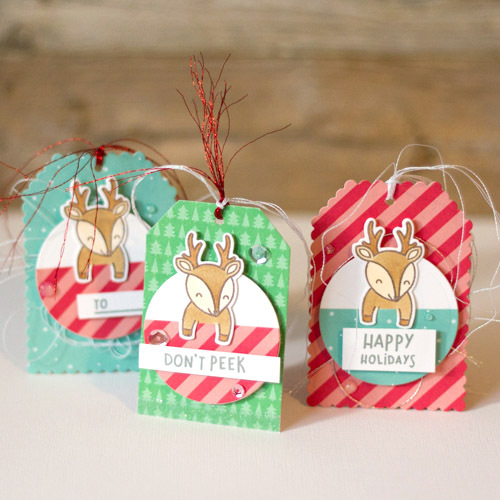 I created this cute set of customized gift tags for the upcoming Christmas holiday! Who could resist this sweet face from the For you Deer Stamp Set? Each tag is slightly different with varying embellishments to keep that personal touch! I popped up the circled embellishment with 3D Foam Squares for dimension, and added sequins secured by Adhesive Dots Micro and Adhesive Dots Mini. Which tag is your favorite? Hello, crafty friends! Super excited to be hopping with Lawn Fawn today! I absolutely love this little get well set called, On the Mend. It was so cute, I made THREE cards using it! The first card I did a bit of masking to get my soup bowl to look like it was in front of the Kleenex box. The images were colored using Copic markers. I kept the card fairly simple so I tucked a scalloped paper underneath the image and attached it to the black card using Crafty Foam Tape. For a final touch, I adhered several sequins to the card using Adhesive Dots Mini. My next card is super simple and super fast! 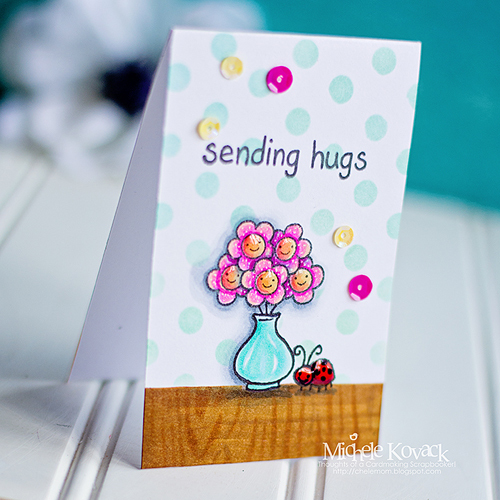 It’s a one layer card using the cute little vase and ladybug designs. First, stamp and mask both of them off so that a polka dot background can be added. Remove the masks and color them with Copic Markers. Add sequins using the Adhesive Dots Mini. Last but not least, a rainbow Band-Aid card! Because who doesn’t love rainbows and Band-Aids? (I work with 9-year-olds and Band-Aids make EVERYTHING better! LOL!) Stamp the image repeatedly to fill the paper and color with Copic Markers. Adhere the card to the black cardstock using Crafty Foam Tape. Stamp the sentiment and pop it up using the Crafty Foam Tape. Once again, adhere the sequins using Adhesive Dots Mini. Find Michele’s Blog at Thoughts of a Cardmaking Scrapbooker. Day 4, click: Lawn Fawn Blog Hop and Giveaway – Day 4! Day 3, click: Lawn Fawn Blog Hop and Giveaway – Day 3! Day 2, click: Lawn Fawn Blog Hop and Giveaway – Day 2! Day 1, click: Lawn Fawn Blog Hop and Giveaway – Day 1! Lawn Fawn Blog Hop and Giveaway – Day 5! Enter to win through the Rafflecopter App. Comments are monitored and will take time to publish. A winner will be randomly picked. International entries are welcome. If you cannot see the comment section (at the bottom of this post), please click: Lawn Fawn Blog Hop and Giveaway – Day 5 and scroll down to the bottom of the post. Visit our Website and Blog! Sign up for our Newsletter so you never miss a contest or giveaway! This entry was posted in 3D Foam Squares, Adhesive Dots & Lines, Adhesives, Announcement, Cards, Crafts & Tutorials, Crafty Foam Tape, Gifts, HomeHobby by 3L, Permanent Adhesive, Premium Double-Sided Tapes, Seasonal Craft Ideas, Winter and tagged 3D Foam Squares Mix White, 3D Foam Squares Regular White, 3D Foam Squares Small White, Adhesive Dots Micro, Adhesive Dots Mini, AJ Otto, Blog Hop, Card, Card Making, Christmas, Crafty Foam Tape White, E-Z Squares, E-Z Squares Refill, E-Z Squares Refillable, Get Well, Gift Tag, Giveaway, Holiday, Lawn Fawn, Michele Kovack, Premium Double-Sided Tape 1/4", Sequins. Bookmark the permalink. 66 Responses to "Lawn Fawn Blog Hop and Giveaway – Day 5"
Awww!!! Such sweet creations!!! Tags are adorable!!! Wonderful get well cards and love the adorable deer tags. Oh they are all so cute! I especially like the don’t peek tag and the last card, i works with just one stamp but it turned out so well! Lovely cards and tags. Thanks for sharing your creativity. Very cute projects today! Love the get well and speedy recovery cards. And I need to get a roll of that crafty foam tape! I have so much of both your products and now I will have to go shopping for more. Thank you for all the inspiration. The get well cards are adorable. I love the little smiley faces on them. Love the projects… especially the tags!! Adorable cards and sweet gift tags! I absolutely love all the projects! Those tags are so cute and I love the rainbow band-aids! Cute cards and tags! Love those get well themed cards. Great inspiration. These are beautiful and cute! Especially love those treat bags! These are such cute cards and tags !! Thank you for the inspiration !! Adorable set of tags and pretty cards! Wowzers!!! So wonderful each and every one of them! I love how colorful they all are. Sooo cute tags and cards! ? So cute :)) Great job! The little tags are darling. for new ideas. thanks for sharing these. Great projects on the blog today. I love the on the mend stamp set. I would make the bandage card for my brothers who fell off a ladder and broke 14 bones a couple of weeks ago. He is on the mend! All of these are so adorable!!! I love the reindeer tags at the top! I can’t wait to play with that set! 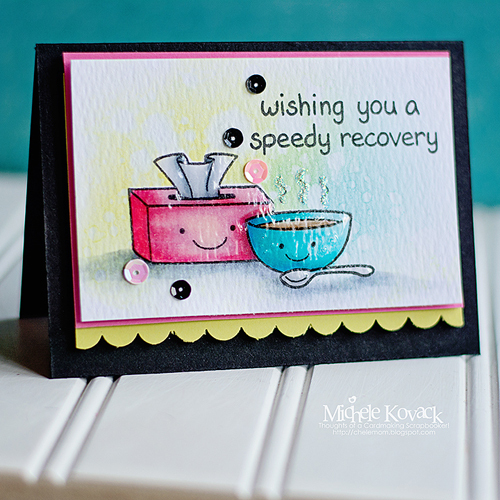 These cards and tags are so adorable…I love that Get Well card with the soup and tissue box! Love the inspiration today. I have this “get well” set from Lawn Fawn and appreciate the ideas. Thanks for a wonderful hop! The team up of Lawn Fawn and Scrapbook Adhesives couldn’t be more perfect. Gorgeous creations!! Love the tags!!! Btw my instagram is Judie90, as I misstyped it in the rafflecopter! All these creations are really adorable and beautiful ! Those little tags are SO SO cute. Great projects, love the get well card and the tags are so cute! The little deer tags are so cute, and I love how colorful the get well cards are. Sure to put a smile on anyone’s face! All of today’s creations are super cute! I love the reindeer tags. All of the watercolor painted get well cards are wonderful! The Deer gift tags are adorable. Who could resist? 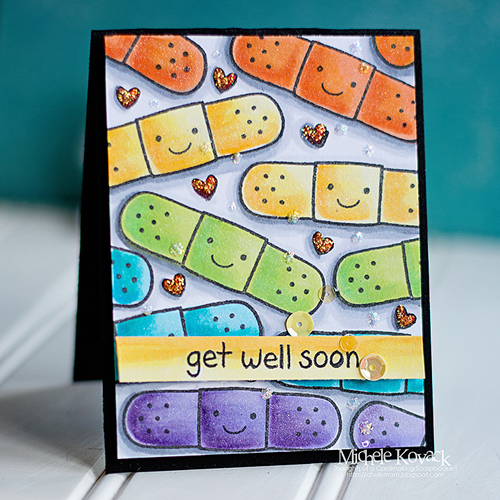 The coloring on your Get Well cards is really perfect–gives just the right feeling. Cute creations. Love your adhesives & Lawn Fawn products too. Great collaboration. Soo cute tags, and lovely catds! ? I adore the colorful band aids card. Cute tags and fabulous cards! Love the last card with all those colours. It’s sure to make anyone smile! Thanks for collaborating with, Lawn Fawn and bringing us a week of great week of inspiration! Such beautifully colored cards and the tags are just to die for!!! Wonderful projects! Love the tags! These are adorable. I love those deer tags! Love the dog stamps and die❤️? So adorable! Beautiful colouring on all the projects. All adorable projects. 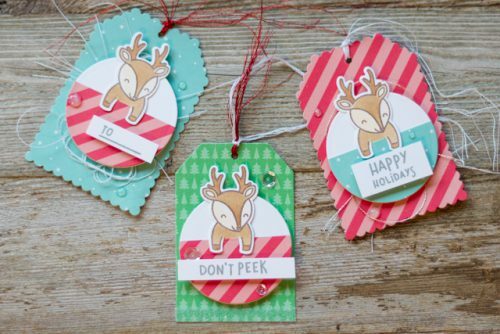 The deer gift tags I can see myself re-creating. .
Love the tags and the cards, especially the rainbow one! Beautiful cards and tags, gift tags are so much fun. Lawn Fawn is my favorite place to buy stamps and die sets. I LOVE Scrapbook adhesives! I have NEVER had an issue with any of their products, like I have had with other companies. The adhesives really holds things where they need to stay. They stay nice when mailed. The foam shapes give our images and embellishments that beautiful dimension we look for, that really top off our projects! Such adorable creations! I really love Lawn Fawn! Love all of these projects, and the subtle glittery highlights in each card! Love all the get well cards!